Nach dem wir die Schlagzeilen-Welle fast hinter uns haben Betreff der Pentagon UFO-Untersuchungen kommt prompt der "Aufwach-Kater" der mehr oder weniger im Tiefschlaf befindlichen deutschen Ufologie welche seit ein paar Jahren stark verwurzelt ist mit der ewig gestrigen Exopolitik. Diese erzählt der Öffentlichkeit die Präsenz der Außerirdischen und jubelt uns immer wieder scheinbare Beweise auf den Tisch, welche sich schnell als Nebelkerze entpuppen. Einerseits will man sich wissenschaftlichen Hauch verpassen und andererseits wird naiv alles aufgeschnappt was einer wirklichen Untersuchung nicht lange stand hält. Auch kommt dann immer eine Schuldzuweisung auf die Medien "welche das UFO-Thema nicht ernst nehmen würden und ins Lächerliche ziehen " obwohl "der schweren Beweise" . In all den Jahrzehnten sieht man die Unfähigkeit der deutschen Ufologie sich selbst zu reflektieren und die Schuld bei sich selbst zu suchen. So lange man zwar propagiert zu wissen was die drei Buchstaben "UFO" beinhalten, aber dennoch den Spruch von Außerirdischer Präsenz auf Erden ohne Beweise damit verbindet macht sich unglaubhaft. Zusätzlich erkennt die Öffentlichkeit im digitalen Zeitalter schnell, WAS sich hinter all der schönen Scheinwelt der Ufologie verbirgt. Das man sich seinen Teil hierzu denkt ist legitim und ein Kopfschütteln nicht verwunderlich. Ebenfalls ist der Begriff Lächerlichkeit in den Medien Betreff UFOs eigentlich gar nicht mehr zu finden, wie es die Ufologen ständig darstellen. Vielmehr wird sachlich in Lokalteilen der Zeitungen bei UFO-Beobachtungen berichtet oder nehmen Redakteure mit kompetenten Stellen kontakt auf und recherchieren selbst. Und wenn überregional wie jetzt über das Pentagon UFO-Programm berichtet wird, bleibt halt der gesunde kritische journalistische Hinweis um die Personen welche das Ganze an die Öffentlichkeit brachten. Und welcher offensichtlicher Zweck der Selbstvermarktung im Vordergrund steht. Klar ist es nicht verboten sich selbst zu vermarkten, wenn man aber denkt man kann die Öffentlichkeit wie in den 50iger Jahren freundlich ausgedrückt hinter das Licht zu führen, ist in der Sackgasse! Dieser Tage schrieb so schön ein Journalist, das es eigentlich verwunderlich ist, es früher in der Zeit der Analog-Kameras bessere Bilder gab als Heute wo jeder ein Handy und Digital-Kameras zur Verfügung hat. Und wenn dann der Begriff Beweise in den Raum gestellt wird kommt von den Ufologen nur der Spruch der Tausenden von Beobachtungen weltweit, sprich Bla Bla Bla... hinter dem man sich verstecken kann ohne zu liefern! What you're seeing is an object that is in a 120 knot head wind [with] a field around it... and it comes to a complete stand still at a perpendicular angle even though there's a 120 knot head wind. Not necessarily. It's looks like it's moving relative to the clouds, but that could simply be parallax from the motion of the jet. It's nonsensical he says there's a "field" around it, as that's just an IR artifact. You can pretty much discount anything else he says that's just his opinion. The appearance of the target slowing down corresponds to the azimuth to it approaching 0˚, ie, to the target becoming straight ahead. So the appearance of it slowing down is almost certainly another optical illusion. Well, those particular "alien" UFOs did NOT have technology which rendered them invisible to radar or optics. If they did, there would have been no sighting and no discussion. The 2004 Nimitz "UFOs" were detected many times on radar by the USS Princeton's SPY-1a radar system. In fact that's how the F-18s were vectored there. Fortunate for the aliens, that was in 2004. Today it's possible the WSO might say "Dude, let me get out my Nikon P900 with an optically stabilized 83x zoom, and we'll get a clear shot of that thing". Or they would just tap our telecom trunks like the NSA does and collect all the info they wanted. It is interesting that alleged star-faring aliens don't seem to have this technology. They are seen joy-riding in the atmosphere at slow speed like a barnstorming daredevil from the 1930s, as if looking out their windows with goggles and scarf trailing in the wind. It therefore seems much more likely the Gimbal and "Tic Tac" UFOs are of earthly origin and only seem mysterious due to the blurry fuzzy nature. If they were really aliens we'd probably never see them. and theoretically exactly what we observe in the gimbal video. Thinking about it, if you want to have a gimbal camera that can move freely to track any target and you also want that system to output a scene that is continuously held stable to the pilot, it seems you actually must have a 'two-camera' set up like this. Since we have never found any conclusive evidence for extra terrestrial life (certainly not any intelligent), the question what some hypothetical aliens can or can not do, or what they would want to do or not, is so open that it is pointless to speculate. I mean, why would they even care if we saw them? I'm sure you could come up with all kinds of reasons but it would just be science fiction. If TTSA had some real evidence of aliens, why only release this fuzzy video with dramatic dialogue added? Why can't the media interview the pilots (in this gimbal case) ? Why isn't the entire FLIR video released? Why isn't radar data and other relevant data also available? Why not interview/hire experts on this ATFLIR pod and see what their conclusion is. And so on. It doesn't seem like they are even trying to convince anyone who isn't already a believer, just trying to get the believer camp to fund their new media company. It seems to me aliens that visited us, they would manifest more convincingly than fuzzy video. There is no reason to assume that because you don't know what you are looking at it equals aliens from outer space. I suspect if the videos weren't fuzzy, the flying object wouldn't be unidentified anymore, and dismissed either as a hoax or as something mundane. That would be a very inelegant solution. If you can record an image on screen with a camera why not record , for instance an optical image at the same point. Now I think I understand your point and it is what I am proposing. I updated my post to add quotes around 'camera' so as to try to make clear I'm not talking about a handheld camera with display screen in the pod being recorded by another handheld camera, exactly as in my demo and possibly inferred from my simplified diagram. I'm talking about an optical image output from the first gimbal camera being taken up by a second user-stabilized camera. The independent motion of the camera looks at least like you'd expect from a gimbal camera, but might also be more than that. Seems to me when the camera lens faces us directly it's perfectly parallel to the housing window, but then as the housing rotates upwards, the camera seems to rotate upwards even faster. Of course this isn't even the ATFLIR system, so the objection takes a big leap to infer the mechanics of the ASELPOD to that of the ATFLIR pod. Watching that housing rotate really underscores how you must have a secondary camera system to stabilize the final output to the user. A pilot simply could not comprehend the direct output of such a gimbal camera spinning all around! And in that case, with a 'two camera' system, the window can stay tightly bound to the lens behind it and the system will still produce a flare rotating around in a stable scene. ...Watching that housing rotate really underscores how you must have a secondary camera system to stabilize the final output to the user. A pilot simply could not comprehend the direct output of such a gimbal camera spinning all around! And in that case, with a 'two camera' system, the window can stay tightly bound to the lens behind it and the system will still produce a flare rotating around in a stable scene. That is correct. If the image was not stabilized and oriented with respect to the horizon, it would be useless to the pilot. If the ATFLIR system does not physically maintain orientation on the first optics, it is nonetheless achieving that down the chain some other way. Here is camera feed and in-cockpit footage (starting at 01:12) of the former F-14 TCS system. It was visible light, not IR but much higher resolution and magnification than ATFLIR. It was a stabilized Cassegrain telescope specifically designed for visual identification of targets far outside normal eyeball range. In this sequence it is slaved to the radar system so automatically tracks the incoming opponent. Fortunate for the Gimbal and Tic Tac UFOs, there was no F-14 close by or (a) We'd be looking at the rivet heads on their alien vehicle, or (b) It would show a mundane earthly vehicle hence no mystery. Isn't the video called GIMBAL because the rotation is due to the gimbal? That would certainly be the simplest explanation, and has been suggested several times. Just to add a bit more to the case. What happens optically can be compared to the so called "nasmyth focus" in astronomical telescopes. For any scientific instrument mounted on this position, a "de-rotator" needs to be used to rectify the (rotating) stellar field. It it a fully optical unit, that uses multiple mirrors. This GIF animation compares the rotation of the target to the ATFLIR camera's line-of-sight (LoS) to it as given in the screen data. This will load slow on the first run, and then it runs the entire gimbal clip at 3x speed. Target rotation seems compatible with gimbal-system adjustments as the target approaches LoS = 0˚. I don't think so. The amount that needs to be rotated depends on the orientation of the first axis of rotation of the window. If this is oriented more vertical than less rotation would be needed on the second axis (along the tube). I don't follow. Frames of reference can be tricky. I suppose I am assuming that the aircraft and pod longitudinal axes are parallel, or when they say aircraft axis they really mean pod axis.. Even if the aircraft is banked, "down" and "side" are still orthogonal, so the resultant vector and its rotation (corresponding to optical axis) is still the vector sum of the two orthogonal components. I guess I am missing something. But with that there's no way for it be be at 0° forward and 2° down. A downward tilt with the window pointing forwards requires something other than twist along the long axis. So a simple orientation change would need the 90° move. But here we are getting into gimble lock - what happens if the camera is at 0.1° down, or 0.0001°? It's a bit head hurting, really needs a proper 3d visualization, but then it is hard because we don't know the mechanics of what is behind the glass. For very small motions, there are fast steering mirrors (FSM). But yeah, that's why it rotates 90 degrees when staring forward. It's designed more for air-to-ground than air-to-air. Edit: By the way, don't assume that the line of sight is orthogonal to the big window. It may be orthogonal to the small window of the Laser Spot Tracker. There's a picture of it without the glass on SPIE. They can't both be right, and tilted windows are good from a reflection point of view, so they are probably both tilted. For lasers windows are also normally wedged because of interference effects. The rotation of artefacts is probably unchanged as a result of the tilt, however. The Roll Drive Unit provides 360 degrees continuous roll, which enables the F/A-i 8 aircrew to persistently observe threats regardless of flight maneuvering. This capability also increases the system survivability. The target tracker acquires and tracks ground and air targets. 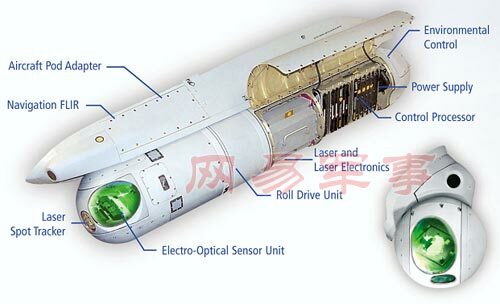 The tracker and servo controller actuate motors in the EOSU and the Roll Drive Unit to point the common optical path LOS at the target. The target tracker and servo controller keep the system pointed at the target for imaging and target designation automatically, without pilot intervention. So rotational adjustments may be affected by the Roll Drive Unit to keep both camera and laser optics simultaneously facing the target. We've only been thinking of the camera and its window, but there are two windows on the gimbal housing and the system keeps both simultaneously facing the target. This adds a highly likely reason for needing to make rotational adjustments (possibly at the Roll Drive Unit) during LOS change, as the above text implies.